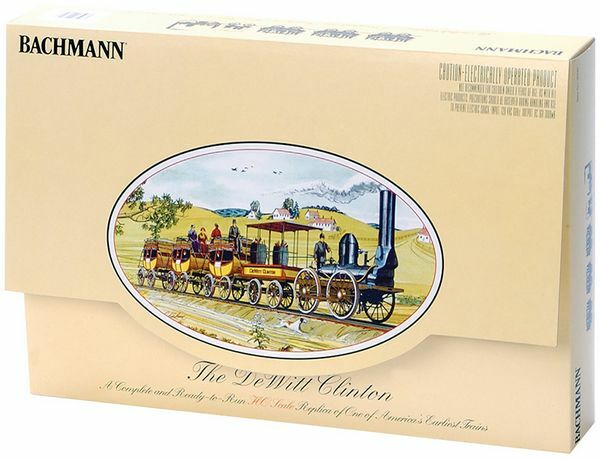 This is an Authentic HO Scale 0-4-0 Replica of America's 3rd Steam-Operated Train - The DeWitt Clinton. It's made by Bachmann for ages 8 and over with Adult Assistance. Only HO scale replica of the DeWitt Clinton available. Small and simple locomotive with a tender and three coaches. Locomotive is black with a boiler, steampipe, standing operator figure and 4 loco drive, nickel silver wheels. Side of tender reads "DeWitt Clinton." Three yellow coaches that resemble horse carriages and read M. & H.R.R. Co. and are labeled by numbers 1, 2, and 3. 47" x 38" oval of nickel silver E-Z track on a gray roadbed. Complete, ready-to-run HO train comes with a plug-in terminal rerailer track. Includes a UL listed power pack and detailed instructions. Locomotive, tender, and train cars are packaged in styrofoam. Bachmann 90-day limited warranty on components other than locomotive. All Bachmann locomotives have a lifetime limited warranty.